Barbara Boyd, 94 of Lancaster, PA passed away on August 2, 2018 at the Calvary Fellowship Homes in Lancaster, PA. She is survived by sister-in-law Marjorie Boyd, nephews Robert A. Boyd, III, and Stephen Boyd & niece Barbara Boyd, great nephew Brian Boyd and niece Kati Boyd & great niece Nancy Boyd. She was born in Orange NJ to Robert A. Boyd Sr. & Dorthea Boyd and longtime resident of Summit NJ. Barbara got her undergraduate degree from Juniata College and got her Masters degree in Christian Education from The Biblical Seminary of NY. 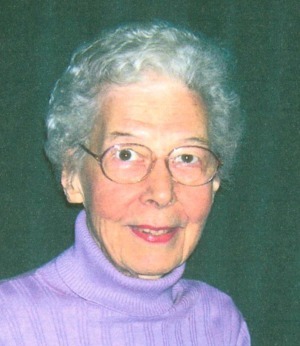 She taught elementary school for a few years after college but left to attend seminary and then joined InterVarsity staff in 1950 and worked there for 40 years. Bible study has always been a hallmark of InterVarsity’s ministry, and for much of InterVarsity’s history, Barbara Boyd was a key leader, as the creator of InterVarsity’s popular Bible and Life program. InterVarsity Christian Fellowship is a vibrant campus ministry that establishes and advances communities of students and faculty. “Barbara’s Bible and Life program influenced over 100,000 students in the USA and Canada from 1964 to 1997,” said Bob Grahmann, InterVarsity Missions Senior Ambassador. “And it’s still influencing thousands of students overseas because it’s still ongoing, and growing, in the International Fellowship of Evangelical Students programs in Europe, Eurasia, the Caribbean, and Africa. Relatives and friends are respectfully invited to attend a memorial service on Thursday, August 9 at 2:00 pm at Calvary Fellowship Homes, 502 Elizabeth Drive, Lancaster, PA tel: 717-393-07111. Interment will follow at 3:30 pm at the Westminster Cemetery, Lancaster, PA. In lieu of flowers, contributions may be made to the InterVarsity Christian Fellowship, PO Box 7895 Madison, WI 53707-7895 or https://donate.intervarsity.org/donate. I am so sorry for your loss. Barbara was a wonderful lady and a key influence in my early Christian life during high school in Summit, NJ. I know she will be missed.